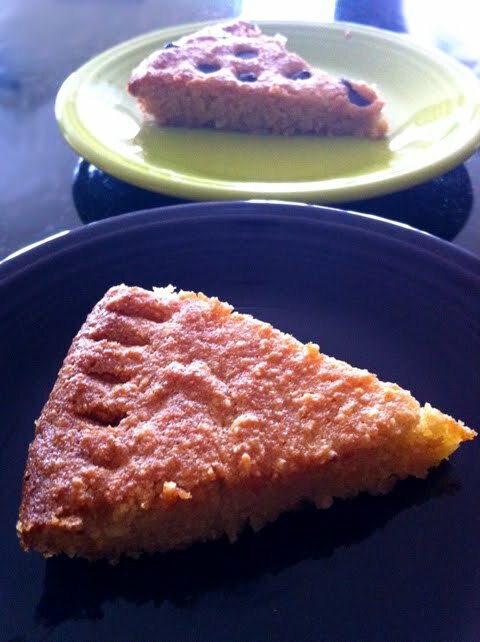 Here is a simple specific carbohydrate friendly cookie cake recipe, sure to please! I started off trying to create a shortbread, but what came out was not at all shortbread like. What we ended up with reminds me much more of a giant cookie cake, with a stronger likeness for the cake than the cookie! This passed the taste test of the youngest member of the family, who does not normally like grain free baking. She LOVED this dessert, and asked for a third piece! The man of the house said this would be a delightful base, layered with a mouse or other delightful fluffiness, or just topped with toasted nuts. As you can see, I added chocolate chips to part of this, which would not be SCD approved, but it is oh so yummy! If you want to add something that IS SCD approved, then use approved fruits instead. I hope you enjoy this grain free dessert! 1/2 Cup softened Coconut oil, Palm shortening, or Earth Balance Butter (Earth Balance is not SCD approved, but if you are not concerned about that, it adds a wonderful butter flavor). Bake at 325 degrees F for 25-35 minutes, or until golden. I used a 9" ceramic pie dish, which worked quite nicely for this batch. Just to be clear...the soy free version of Earth Balance is not allowed on the specific carb diet?